Last week it was one milestone on the Trans Canada Highway, and this week another but on the other side of British Columbia. We’ve been building up to this event for a few weeks now: The Trans Canada Highway 50th anniversary and we hope you’ve enjoyed our trip down memory lane (see what I did there?). We really want to thank those who helped clarify some of our historic photos on our Facebook page. Couldn’t have done it without you. Hey, it wasn’t all about Canada’s Main Street over the last seven days – Port Mann tolling started, communities across BC enjoyed a smoother ride and a couple of projects announced that were all about safety. 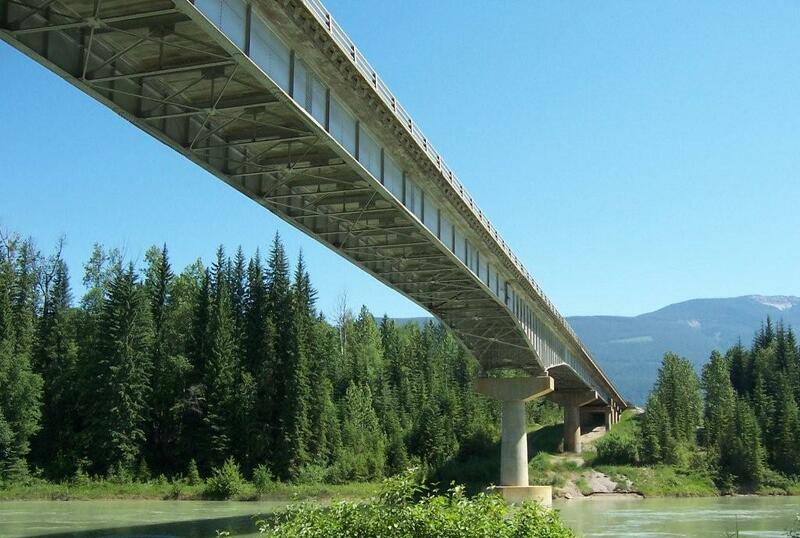 The old Donald Bridge on the Trans-Canada Highway, 26 km west of Golden, was over 50 years old. It now boasts four lanes. Friday, eastern BC enjoyed two big events, the 50th anniversary of the Trans-Canada Highway and the construction of the new four-lane Donald Bridge. Perhaps taking a cue from the widest bridge in the world: The Port Mann, the new Donald Bridge is twice as wide as the old one, the curves on the approaches are smoother, and there is three-and-a-half kilometres of new four-laning. To mark the big event, a couple of memorials were set up – a plaque commemorating the 50th anniversary of the Trans-Canada Highway was placed on the original commemorative cairn located on the highway east of Revelstoke and for the new Donald Bridge, a plaque recognizing the project’s workers was unveiled. If you could sum up the BC highway activity with one word this week, it would be “safety”. From the Peace, to Squamish, from Nechako Lakes to the Fraser Valley, small but impactful projects got underway to boost safety in the local communities. a pedestrian-activated traffic signal has been installed on Highway 97 at 46th Street to help those needing to cross the highway to access the library and recreation center and Chetwynd Secondary School. In Groundbirch, two streetlights have been installed on Road 265 better help you see where you’re going and increase safety for community members who cross Road 265 to access McLeod School and community hall. In Rolla, five LED streetlights have been installed at the intersection of Rolla Road and Sweetwater Road. Fort Nelson gets three new streetlights at the intersection of Alaska Highway and 55th Street in Fort Nelson. Better lighting, improved safety for pedestrians crossing the Alaska Highway on their way to the Northern Rockies Regional Recreation Centre and Art Fraser Memorial Park. Constructing a sidewalk in Houston on Highway 16 between Tweedie Road and Benson Road to connect community paths with the signalized pedestrian crossing at Tweedie Road. Installing a speed reader board on Highway 16 in Burns Lake at the east end of town and a speed reader board on Highway 16 in Houston at the west end of town. Installing two speed reader boards on Highway 16 in Fort Fraser, one at each end of the community. Installing a flashing green, pedestrian activated signal and new street lights on Highway 27 through the Nak’azdli Reserve. Keywest Asphalt Ltd. will resurface a 10-kilometre section of Highway 7 in Mission. Lafarge Canada will resurface an 11-kilometre section of Highway 1 in Chilliwack. Highway 97 through West Kelowna will see the installation of advance left turn signals at the intersections of Bartley and Gellatly/Gossett roads. You have to work with what you have…and are planning to get. With a new plan, Translink is cutting costs and making the best use of existing resources to drive new revenue. The draft 2013 Base Plan identifies a lot of new efficiencies, around $98 million worth annually through the next three years. Following through on these plans, along with drawing on the reserve fund, will fill a part of the needed funding to maintain existing services and allow a number of planned transportation improvement projects to proceed. 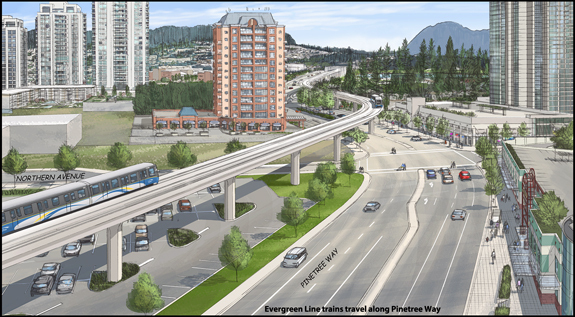 Evergreen Line will link Coquitlam and Port Moody to Vancouver and the existing SkyTrain system. The region’s contribution to the Evergreen Line project. 109,000 new hours of transit service. Some hours were implemented in April 2012. Rapid Bus service on Highway 1 over the Port Mann Bridge from Carvolth Transit Exchange in Langley to SkyTrain in New Westminster, every 10 minutes during peak hours and 30 minutes during off-peak hours. B-Line service every seven to eight minutes on King George Boulevard and 104th Avenue between Newton and Guilford. Upgrades to Expo Line stations including improving capacity and accessibility at Main St. and Scott Road, Metrotown, Commercial-Broadway, Surrey Central, New Westminster and Joyce-Collingwood stations. Are you registered? TReO style? Registration with TReO, the toll system on the new Port Mann Bridge, opened this week. You can register online, anytime at the website, all you’ll need is your license plate number, payment information, and contact information as it appears on your ICBC Autoplan vehicle insurance. A lot of people couldn’t wait. Thousands of people have already signed up to secure the half-price introductory toll rate for a full year. To secure that introductory rate, you’ve got to register by February 28, 2013. Register by November 30th and you’ll receive also receive a $30 account credit (aka 20 free trips for passenger vehicles). Ok, my hand hurts from typing. That’s a lot of news. If you have any questions, connect with us on Twitter or Facebook. And, if you online newspapers more appealing for a rundown of info, check out and subscribe to our Paper.li – a collection of info, video, stories and blogs from all the big players in BC Transportation, including BC Transit to BC Ferries, from Prince George Airport to Port Metro Vancouver.